The Guelaguetza is the most colorful and exhilarating of the multitude of festivals in Oaxaca, with pageantry unrivaled in all Mexico. In a state with 16 different indigenous cultures, each with unique traditions, language, food, music, dress and dance, it should come as no surprise that the annual two-week July extravaganza draws both Mexican nationals and tourists from all corners of the globe. The official Guelaguetza celebrations, commonly referred to as the Lunes del Cerro (Mondays on the Hill), take place in an open-air auditorium overlooking Oaxaca City. They occur the last two Mondays of July, except if the second last Monday of the month falls on July 18, the anniversary of the death of Benito Juárez, Mexico’s first indigenous president and Oaxaca’s native son. In this case the festivities take place on the subsequent two Mondays. Folkloric dance troupes come to Oaxaca from the farthest reaches of the eight regions of the state to perform their distinctly unique dances to traditional native music. The live performances are designed to convey the richness of day-today life in the particular part of Oaxaca, ranging from representations of marriage rituals, to coastal net fishing. Some have a not-so-subtle always humorous sexual subtext manifest in both dance and telling of local tales. Imagery and movement are sufficiently universal to ensure that knowledge of Spanish is not a pre-requisite for enjoying and becoming thoroughly enthralled in what is being recreated through dance, music, and at times light discourse. Guelaguetza has been translated from the Zapotec both as “offering” and the “reciprocal exchange of gifts or services.” The pre-Hispanic origins of the Guelaguetza assist in unraveling the relationship between its literal meaning and its current format, including why, where and when regional delegations descend upon Oaxaca to reenact spectacles of indigenous rites. More than three thousand years ago hunters and gatherers of the region began to develop a more sedentary lifestyle, in large part due to the cultivation of corn, then other foodstuffs such as tomatoes, squash, beans and chiles. But corn remained the key staple, and the rains which traditionally began during the summer months assured its growth and an abundant supply throughout the year. It thus became usual practice to pay tribute to the gods and goddesses responsible for bountiful yields during mid-summer to ensure that the rains continued and thus produced the healthiest of fall harvests. This manifested in the giving and exchange of initially foodstuffs and then locally handcrafted products such as clay pots and other wares. The feast of Xilonen, goddess of tender corn, fell on what is in the Christian calendar July 16. The Spanish, upon arrival in Oaxaca in 1521, on the one hand attempted to impose their beliefs on the indigenous peoples through conversion to Catholicism, while on the other sought to maintain at least some relevance for the natives through reinterpreting their longstanding traditions. One way was to incorporate the Guelaguetza into the July 16 celebration of the feast of the Virgin of Carmen, beginning at the church of Carmen Alto, once a Zapotec site. Eventually the Guelaguetza began to focus on the two Mondays following July 16, and its location changed to the th “Cerro del Fortín” which during the 15 century had become the location of Aztec garrisons. The ridge was, and thereafter remained, a place for gathering – and celebrating the th Guelaguetza. In 1932, as part of the city’s 400 anniversary festivities and its designation as a royal city by King Carlos V of Spain, the forerunner of the modern Guelaguetza was born, with representatives of ethnic groups from the different parts of the state invited to participate. Thus, 2012 takes on special th significance, and has been designated as the festival’s 80 anniversary. La Temporada de la Guelaguetza is a time for every Oaxacan to set aside political differences, inequalities and struggles, to pay tribute to the state’s multiplicity of rich cultural traditions. The festivities also serve as a reminder that both government and the people must, for generations to come, strive to preserve indigenous heritage through promoting each culture’s precious customs. Watching the Guelaguetza is awe inspiring. It enhances our appreciation of the different mores and traditions which have endured for centuries, if not longer. It reminds us of the state’s so very rich diversity of rituals. At the end of each troupe’s performance, members toss gifts (i.e. offerings) to those in the stands, products brought down from their particular sub-region, ranging from straw hats and mats, to coffee, fruits, vegetables and nuts, to souvenirs created specifically to distribute. One cannot help but leave the Guelaguetza exhausted from cultural overload, but with a special understanding of the magic of Oaxaca. For Oaxacans it instills a renewed pride. 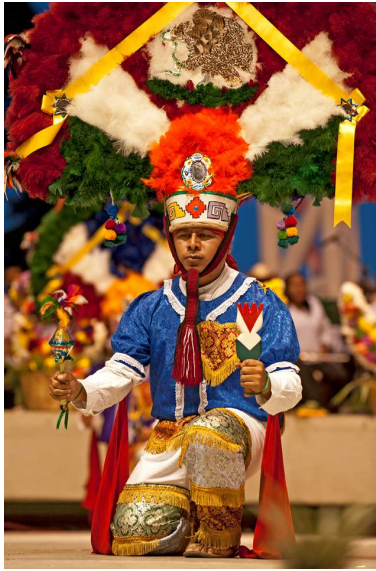 This year, ancillary events include the downtown parade of delegates on the Saturdays, and Sunday evenings at 8:30 p.m. at the same auditorium the performance of the Legend of Donají, the last Zapotec princess (at a cost of 100 pesos for seating in palcos [stands] A & B, upper seating free). Though still in its planning stages, on the Sunday evenings a performance entitled Las Tradiciones del Istmo is scheduled for La Plaza de la Danza. The Guelaguetzas take place July 23 & 30, at 10 a.m. & 5 p.m. (free in the upper sections, but attend hours early to be assured seating; otherwise, tickets are 800 pesos for Palco A and 600 pesos for Palco B, available through Ticketmaster, tourism offices and select travel agencies). Each event lasts three hours. Many of the towns and villages hold free Peoples’ Guelaguetzas during the two week period. Ask for dates, times and locations at your lodging. They too are very entertaining. But nothing compares to the state sponsored Guelaguetza on the Cerro del Fortín; experiencing all the color and pageantry on a grandiose scale while sitting in the stands, the stage in front, the spectacular valley of Oaxaca and distant mountains as backdrop. Alvin Starkman attended his first Guelaguetza in 1991. He is a paid contributing writer for Mexico Today, a program for Marca País – Imagen de México. Alvin and his wife Arlene operate Casa Machaya Oaxaca Bed & Breakfast (www.oaxacadream.com). Alvin frequently takes visitors to the sites in Oaxaca’s central valleys.